Smoke detectors are one of the most important devices we have in our homes, yet they are also one of the most overlooked as well. The bottom line is that they save lives and people should give more thought to make sure they have good quality alarms and also ensure that they are working. So what should a buyer look for? There are two main types of sensors that detectors employ – photoelectric and ionization. Most models have just an ionization sensor that works for detecting flaming fires. Photoelectric sensors detect smoldering smoke. So the best smoke alarms will have both sensors, but you can also use a combination of both types placed in strategic spots throughout your house. Buyers should also be aware that they can be powered either by batteries or hard-wired into your electrical system. Those that are hard-wired can be more difficult to install, but are more likely to work in the event of an emergency. Interconnected alarms are another feature to look for. These models can communicate with each other so that when one alarm goes off, they all go off. These are typically hard-wired, but there are now wireless options available. Below we review our choices for the top 10 best smoke detectors. At the bottom of these smoke alarm reviews we also have a comparison chart to easily compare one smoke detector versus another. 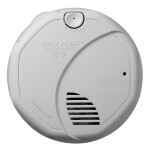 We ranked the $21 First Alert BRK 3120B as the best smoke detector. This unit is also recommended by the leading consumer magazine. It is hardwired for power and connectivity with 2 AA batteries providing backup power. The BRK 3120B has dual sensors, both ionization and photoelectric, which work great at detecting hot or smoldering fires to protect you and your home. Overall there is nothing really to complain about with this First Alert smoke alarm, however since it is hardwired it can be a bit of a pain to install. 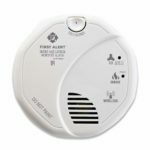 If you get tired of having to replace batteries in your smoke alarm, then you should consider the First Alert BRK 9120LBL which sells for around $21. This detector is hardwired for power, but also comes with a lithium battery backup that will last 10 years. 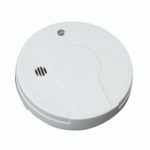 The BRK 9120LBL only has an ionization sensor, but it can connect to any other compatible BRK or First Alert smoke detectors. Overall the First Alert BRK 9120LBL will provide worry-free service for a long time. 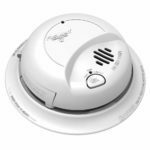 The $12 First Alert BRK 9120B is the best selling smoke detector on Amazon. This model is hardwired for AC power and connectivity with a 9V battery for backup power. It only has an ionization sensor, so it is best used in conjunction with other models including at least one photoelectric model. If you are looking for a cheap, hardwired smoke alarm with battery backup then the First Alert BRK 9120B is the perfect choice for you. The $119 2nd generation Nest Protect is like peering into the future. This thing is beautiful and works amazingly well as part of a smart home with wireless connectivity and an app that you can use to control it. Besides being just a smoke detector, it also is a carbon monoxide alarm and comes in two versions which can be either hardwired for AC power or powered by 6 AA batteries depending on the unit you buy. The main drawback of the Nest Protect is the price. At $119 for one device this thing is expensive, especially if you have a large home that will require several units. 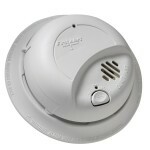 The $30 Kidde RF-SM-DC is our choice for the best battery powered smoke detector. It only has an ionization sensor and is powered by 3 AA batteries. 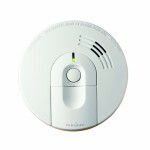 Another nice feature is the wireless inter-connectivity which lets it connect to other alarms so that when one goes off, they all go off. This also makes it very convenient to install in any home, since you don’t have to connect any wires. If you do purchase the Kidde RF-SM-DC you might want to install a photoelectric sensor somewhere in your house as well. The cheapest smoke detector on our list is the Kidde i9050 which sells for just over $10. This thing is powered by a 9V battery and features an ionization sensor. The i9050 does not interconnect with other alarms, but it it very easy to install and works quite well. 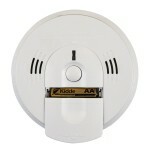 Another cheap hardwired smoke alarm to make our list is the Kidde i4618 which sells for about $14. It is hardwired, interconnected, and features a 9V battery backup. The i4618 only has an ionization sensor so again we recommend that you install a photoelectric sensor in conjunction with this smoke detector. If you want a wireless combination smoke and carbon monoxide alarm and don’t want to pay the high price of the Nest Protect, then you should consider the First Alert SCO501CN-3ST which sells for about $50. This model is powered by 2 AA batteries and will wirelessly connect to other compatible alarms. It uses a photoelectric sensor for smoke detection. One unique feature of the SCO501CN-3ST is that in addition to a loud 85-decibel siren is a voice alarm with 11 programmable locations indicate where and what the threat is. 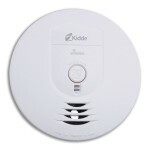 If you are looking for a cheap combination smoke and carbon monoxide alarm then take a look at the $30 Kidde KN-COSM-BA. This thing is powered by 3 AA batteries and features only an ionization sensor. It also has a voice alarm that will say either “Fire!” or “Warning Carbon Monoxide”. On the downside it can not network with other alarms, so it is best for small homes that only need one unit. If you don’t need interconnected detectors then we think you should consider the First Alert SA320CN which will cost about $23. Powered by 2 AA batteries it is the cheapest alarm that has dual ionization and photoelectric sensors which work great at detecting smoke or fire. One negative is that the dual sensors tend to create more false alarms which can be annoying, but it is better to be safe than sorry. Overall the First Alert SA320CN is a good choice for small areas that only need one alarm.